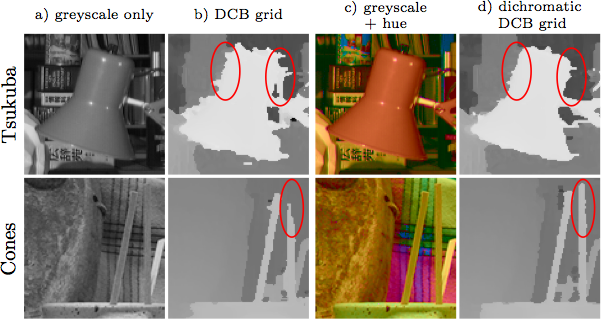 Comparison of input images (a, c) and disparity maps of the (b) greyscale and (d) dichromatic DCB grids. The input images are displayed as ‘seen’ by the algorithms. Note that the dichromatic DCB grid (d) visibly improves on (b). We introduce a real-time stereo matching technique based on a reformulation of Yoon and Kweon’s adaptive support weights algorithm . Our implementation uses the bilateral grid to achieve a speedup of 200× compared to a straightforward full-kernel GPU implementation, making it the fastest technique on the Middlebury website. We introduce a colour component into our greyscale approach to recover precision and increase discriminability. Using our implementation, we speed up spatial-depth superresolution 100×. We further present a spatiotemporal stereo matching approach based on our technique that incorporates temporal evidence in real time (>14 fps). Our technique visibly reduces flickering and outperforms per-frame approaches in the presence of image noise. We have created five synthetic stereo videos, with ground truth disparity maps, to quantitatively evaluate depth estimation from stereo video. Source code and datasets are available on our project website.